you can ask anyone you like, but i think you'll be hard pushed to find someone who would describe me as an organised person. while i imagine that the professional cycle press have everything marked out on a wall planner as to when review items are due to arrive, who's going to test/review each set piece, and the deadline as to when the end result with accompanying photography should be on the editor's desk, my life is not like that. i'm not saying those deadlines are necessarily met, and if my own experiences are anything to go by, i'd be surprised if every requested item turns up at the appointed hour. however, the very existence of some sort of a plan is a good start, one sadly missing from thewashingmachinepost. perhaps, of course, i am letting go of secrets that should be kept well hidden; in much the manner of a jazz drummer, there's a distinct difference between me noting what it was i intended to do, and your appreciation of same. it's really only a mistake from my point of view; you've no idea what i intended in the first place (have you?). 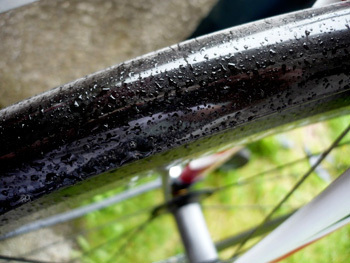 so therefore i will now attempt to convince you that my continuity has acceded to another and hitherto unattained level, by following yesterday's piece on the ride of the falling rain with a review of pete tomkins' latest mudguard offering for the race bike enthusiast who wants to keep bum and feet dry. version one seems to have been, by all accounts, well received by the you're not putting mudguards on that brigade. their sleekness, blackness and minimal design often encouraged a double-take amongst the pelotonese, just checking whether they'd actually really seen guards/fenders on that trek madone/pinarello dogma/specialized tarmac (delete as applicable). the non-existence of anything like the kind of clearances you'd need for guards on a road bike, meant that a degree of assembly was required. this was underlined when fitting a pair of full wood fenders to the cielo, the latter arriving with stays in place and in one piece. 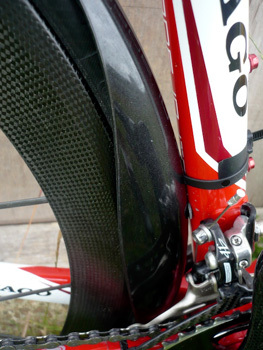 roadracers are going to be positioned on machines that laugh in the face of mudguard eyes, should it even be possible to fashion such in carbon fibre in the first place. if you have a wee look at the space between the top of the tyre and the underside of the brake caliper, there is a less than evens chance that an assembled fender is going to slide in there from front to back. therefore, roadracers consist of a big bit, two smaller bits, and some flexible stays. and some incredibly footery screws and nuts. it would not be overstating the case to say that a modest degree of patience is required when fitting, as well as wheel removal, and some electrical tape near to hand. the latter ought to be wrapped around the rear stays and front forks to prevent marking of perhaps fragile paintwork. 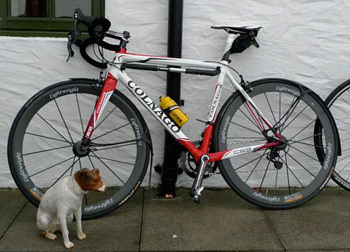 in the absence of the aforementioned mudguard eyes, roadracers arrive with four that are double bungied in place. if the front forks are of the chunky variety (as was the case on the test bike), add some finger strength and nimbleness to the list of requirements. the mark twos now have the benefit of little spongey, sticky dots to place fore and aft of the zip tie to take out any annoying buzz, as well as protect calipers and paint. since the guards cannot be held in place by the usually recessed brake bolt, the roadracers are zip-tied to the brakes to retain the assumd position. mark one had basic, use once zip ties; number two arrived with re-usable ties, which can be released by means of a tiny moulded lever allowing continual replacement if necessary without needing a constant supply of zip-ties. but apart from all that, what's the difference? one of the often asked for features, missing on version one, was the shortness of the rear guard forward of the brake. i do find it quite humorous that squillions of roadies, long aghast at the idea of putting mudguards anywhere near their beloved carbon fibre, were sufficiently incensed to e-mail pete at crud to point out that the rear guard still allowed accumulation of road grit and splashing of water into the front mech and its associated cable. some folks are never satisfied. it was also noticeable that, when following a roadracered bicycle, the curve did not head rearwards and roadwards far enough, and it was still possible to experience a constant stream of rainwater heading towards those oakleys or rudy projects. version two has solved both problems in one swell foop. the guard now continues all the way down to the junction of the bottom bracket shell and the chainstays, stabilising against the seat tube with more of those spongey dots and a couple of larger, re-usable zip ties. 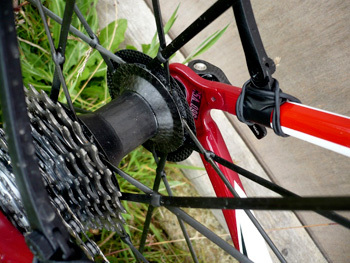 this latter grips between the two seat tube bottle cage bolts, thus getting in no-one's way. on the drive side, the moulding has been extended in an aesthetic curve towards the front mech, thus granting one of those three wishes. the tail-piece, bearing the liturgy of number two, travels a long way round the wheel. i had no verbal complaints from stragglers in my wake. the front guard fits in similar fashion, but version two has options available for the terminally indecisive. you can have two lengths on that little bit front of the brake, the bit that never seems to sit straight, and you can have long and trailing or not so long and trailing on that wheel curve to the rear. one or two of my accomplices favoured fitting their original roadracers minus the little brushes designed to keep the braking surface clear and to stabilise the guards against the wheel rim. 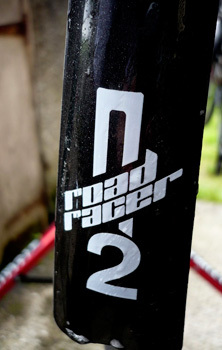 in order to test this theory, i fitted the new roadracers and omitted the brushes. i will attest to a modicum of shake, rattle and roll, but nothing untoward. however, pete tomkins aka mr crud said "i recommend always using the pilestrips. they keep the guards centred, even on a sharp out-of-the-saddle climb. they also definitely keep brake surfaces free of grit in bad weather." i am of the opinion that the designer often knows best, and mine are now fitted. version one seems also to have suffered from tyre rub on occasion, particularly on the rear. it's something i confess to having experienced myself, and something that brought pete to post a video on the crud website showing just how such could be avoided. fitting the mark twos, without any hocus pocus at all, resulted in a complete absence of tyre rub, something that has continued throughout the test, despite the intransigence of deep carbon rimmed wheels, and even a set of tubulars. the result we were looking for. sneak back a few months and there would have been cries of sacrilege from any self-respecting roadie. one doesn't clad oneself in rapha or assos to have such style negated by the affixing of mudguards to sleek and very fast carbon, though as michael hutchinson was wont to point out, it was seemingly quite acceptable to have sartorial elegance interrupted by a long brown stripe up the back of the rapha or assos jersey du jour. that pete tomkins was able to attack this climatic prejudice by offering fenders that almost weren't there, is testament to a mind willing to bang itself off a brick wall long enough to gain a modest degree of acceptance. version two is less invisible than version one, but there has to be a trade-off when adding bits; in terms of the benefits conferred, any heightening of profile is to be welcomed with open cleats. i cannot tell a lie; despite the earnest scene-setting in which i have indulged over the years, and the naming of our annual ride after a mode of precipitation, torrential never quite made it this far over the test period. rain i did have, along with copious quantities of surface-water, and the rain-jacket gained an outing or three, but undoubtedly the best time to report on the efficacy of mudguards would be as autumn merges into winter. that doesn't happen for another couple of days over here; your mileage may vary. however, on the basis of the success gained with roadracers mark one, it seems a safe bet that more bits will mean less rain. i can now happily transfer the rest of the test over to you. fit a pair of these and observe the dryness that back, bum, feet and bicycle nether regions enjoy as summer becomes a distant memory. to help at least a couple of you do exactly that, mr tomkins has graced me with two pairs of mark two roadracers to give away to those who can successfully answer the question listed below. answers should be sent to crud@thewashingmachinepost.net, and please include a full postal address to show that you're confident of winning. in which country does the rain stay mainly in the plain?